The exhaust system features a strong, investment cast, T304L inlet and outlet designed to maximize flow and minimize turbulence. By casting the inlet, APR’s engineers were able to create a smooth and high-flow exhaust path that maximized flow through swept blends and shapes that are otherwise not possible through conventional fabrication techniques. The inlet perfectly matches the factory turbocharger’s 77mm outlet and gradually necks down over a long distance to further enhance performance. The mounting flange and bracket are integrated into the casting, and TIG welding at the flex section ensures a clean inner surface eliminating turbulence, vortices and eddies to the highest degree. With a nominal wall thickness of 2.55mm the downpipe is strong and produces a refined exhaust note compared to thin wall tubing systems. The cast sections undergo a tumbling process to smooth and de-burr any imperfections inside the pipe, while simultaneously enhancing the exterior finish. Lastly, all necessary surfaces are CNC machined for an accurate fit. APR’s engineers specified a T304L stainless steel, OEM-style flex section that is fully sealed with a corrugated inner lining to improve flow and reliability. The low profile design and minimal use of bradding material eliminates clearance issues common with other designs that can billow, rub, rattle and fray over time. Designed to stand the test of time, the bracket is CNC machined from 8mm-thick billet T304L stainless steel and the hanger feet are threaded into place, eliminating the need for welds. Weight is removed from the bracket, wherever possible, while not hindering its structural integrity. The bracket attaches to the cast downpipe’s integrated mounting bracket, and CNC machined spacers enable compatibility across multiple vehicles. 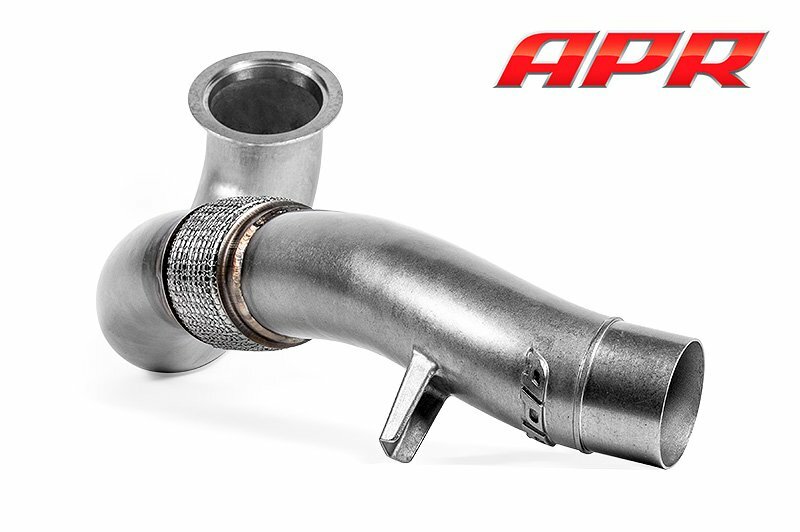 APR’s Engineers paid special attention to the details when designing the APR Cast Downpipe Exhaust System all the way down to the oxygen sensor bungs. APR’s O2 bungs are investment cast from T304L stainless steel and are curved to perfectly fit on 76mm piping, without protruding into the pipe, as this would further impede airflow beyond the sensor itself. The bungs are TIG welded to the piping and back-purging is used to ensure the interior surface is smooth and clean. Lastly, a billet T304L stainless steel bung plug is included to cap off extra ports not needed on some models. 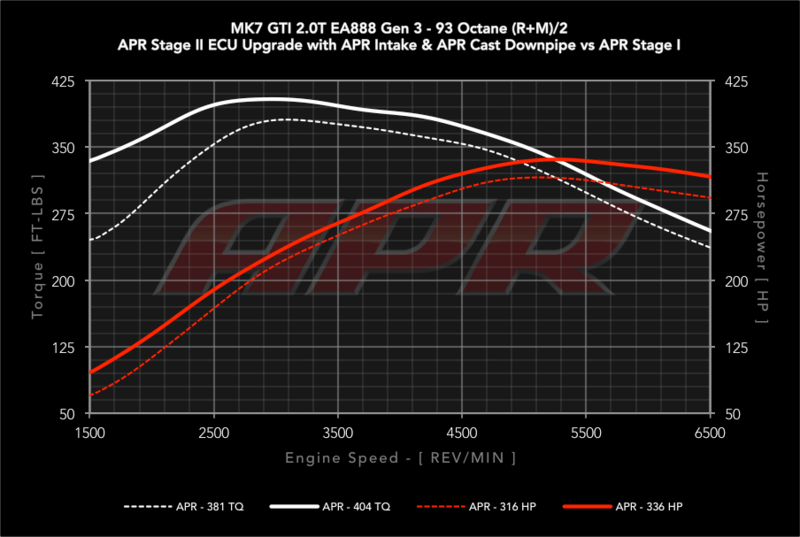 Reported wheel figures measured on APR's in house Dynapack Dynamometer with a 2014 MK7 Golf Tiptronic and 2014 MK7 GTI DSG, using SAEJ1349 correction and an average of multiple runs. Crank figures estimated based on the measured wheel figures. Results will vary depending upon environmental conditions, vehicle, transmission, vehicle health, operating conditions, temperatures, fuel grade, dyno type, dyno setup, and other modifications. FWD = Front wheel drive. LHD = Left hand drive. RHD = Right hand drive. E-Differental = Electronic locking differential.